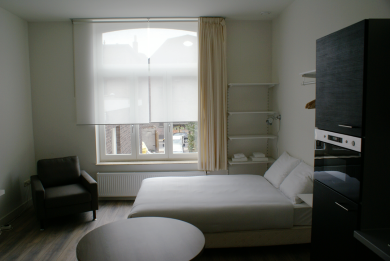 Seven to Living offers two types of studios: the "standard studio" and the "large studio". Both types are fully furnished in a contemporary style and have a floor area of approximately 35 m². There is a combined living room/bedroom and a luxurious bathroom fitted with a rainshower. The general facilities are the same for all the apartments. The studios also have a separate storeroom in the basement and residents can enjoy the shared roof terrace. The studios are located on the first, second and third floor. The all-in rental price starts at € 995 per month. If you are interested in our studios, please feel free to contact us.